Bringing together exciting new interdisciplinary work from emerging and established scholars in the UK and beyond, Litpop addresses the question: how has writing past and present been influenced by popular music, and vice versa? Contributions explore how various forms of writing have had a crucial role to play in making popular music what it is, and how popular music informs ’literary’ writing in diverse ways. The collection features musicologists, literary critics, experts in cultural studies, and creative writers, organised in three themed sections. 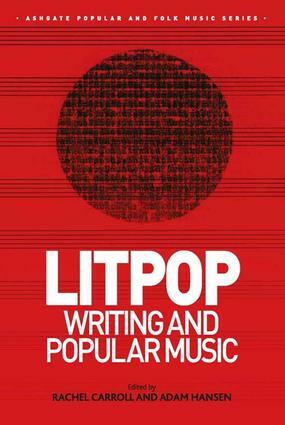 ’Making Litpop’ explores how hybrids of writing and popular music have been created by musicians and authors. ’Thinking Litpop’ considers what critical or intellectual frameworks help us to understand these hybrid cultural forms. Finally, ’Consuming Litpop’ examines how writers deal with music’s influence, how musicians engage with literary texts, and how audiences of music and writing understand their own role in making ’Litpop’ happen. Discussing a range of genres and periods of writing and popular music, this unique collection identifies, theorizes, and problematises connections between different forms of expression, making a vital contribution to popular musicology, and literary and cultural studies. Dr Rachel Carroll is Principal Lecturer in English at Teesside University, UK, where she teaches contemporary fiction, feminist theory, film and television adaptations and African American writing. She is editor of Adaptation in Contemporary Culture: Textual Infidelities and author of Rereading Heterosexuality: Feminism, Queer Theory and Contemporary Fiction. Dr Adam Hansen is Senior Lecturer in English at Northumbria University, UK. He is author of Shakespeare and Popular Music (2010), and numerous articles and chapters on early modern literature, in its own time and in ours.